Designed and manufactured by AKG at the request of Telefunken, the Ela M 251 was a 3-pattern tube mic built around AKG’s famed CK12 capsule. Telefunken had never manufactured microphones, but instead served as the distributor — and brand name — for mics made by Neumann and AKG. 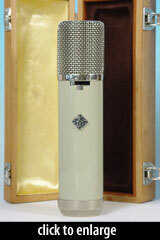 Notably, the early U 47 microphone was branded by Telefunken, despite having been designed and manufactured by Neumann. When Neumann began distributing its products under its own name, Telefunken was reportedly left without a large-diaphragm condenser in its product line, and commissioned AKG to develop a replacement. Ela M 250/251 - This mic used a hard-wired Telefunken AC701k tube. 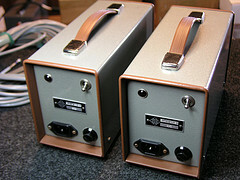 Ela M 250E/251E - The “Export” version of the 250/251 used a socketed 6072 tube, which at the time was more readily available outside of Europe than was Telefunken’s AC701k. How were the C12 and ElaM 251 different? 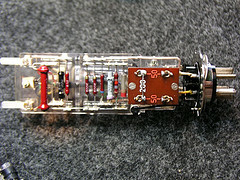 The circuit in the Ela M 250 and Ela M 251 were similar to, but not identical to the circuit in AKG’s C12 microphone. In additional to various voltage differences, the Telefunken-branded mics had pattern-control switches on the microphone body — whereas the C12 put the pattern switch on the external power supply. Also, the tube in the 251 was inverted, to shorten the distance between the capsule and the tube connection. Long wire runs in the C12 led to capacitance losses that can affect the performance of the microphone. The two mics have different shapes. The size, contour, and placement of the mics’ headbaskets and grilles affect the frequency response of the capsule, even though the capsules are the same. The ELAM and C12 timbres are very much related… However, in addition to a lower noise floor, the ELAM’s head construction and circuitry makes for a slightly more opaque sonic impression, which, considering the considerable amount of overall clarity and high frequency content of a C12, is not a bad thing at all. The 251 had the same capsule with different circuitry and a very different grille and body. The grille has an additional layer of mesh internally, which tends to smooth out the high frequencies and adds a peak at 5 kHz. It also tends to make the resonance at 12 kHz a bit narrower. The 251 also was designed to have less bottom end, and rolls off starting at about 100 Hz or so, and this gives the mic a good characteristic for female vocals. How are the Ela M 250 and Ela M 251 different? The 250 was a 2-pattern mic (cardioid and omni). The 251 included cardioid, omni, and figure-of-8. The 250/251 mics introduced a new feature to the industry. 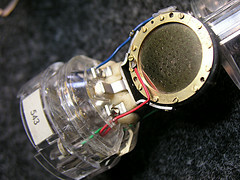 Both mics were designed in a modular fashion with the intention that the mics could be repaired without tools, by replacing components or assemblies. For example, if the circuit were to fail, a new circuit (encased in a plastic holder) could be easily snapped into place. 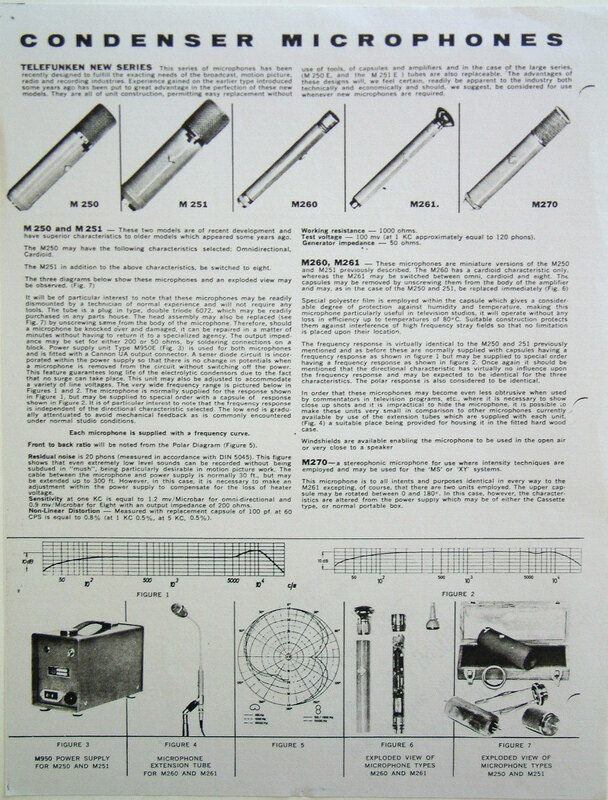 The tube was socketed; the 6072 tube in the E-for-Export version of the mic could be “readily purchased at any parts house” (according to Telefunken sales literature of the day). The mic shipped with a 30-foot cable, the tube power supply, a padded wooden storage case for the microphone, and an individual frequency graph. See this series of Ela M 251 photos taken by Mike Castoro of Wunder Audio. In early 2009 he sold a mint pair of “investment grade” 251s at auction. The photos show a pair of what must be the best-preserved 251 Es in the world. The mic was released in 1959.